Here are two well-upholstered Dutch late-romantic symphonies. 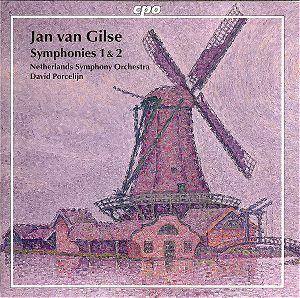 Van Gilse, who was born in Rotterdam, wrote four symphonies of which these first two echo with the influences of the great Austro-Germanic classics: notably Bruckner and Brahms. That these voices should be so deeply bound up in these works is no surprise as he studied in Cologne with Franz Wullner and worked for many years in Bremen and Munich. The writing in the First Symphony is satisfyingly rounded and honours the classical styles of Brahms 1 and 4 and Schumann 3 and 4. The finale is an Allegro con spirito and lives up to the name in both roseate warmth and a certain glowing confidence. The Second Symphony is in three movements. Its initial Andante - Allegro energico is sanguine, sunny and stormy. Its sometimes celebratory tone recalls a hybrid of Glazunov and Brahms. Indeed it is Brahms’ Symphonies 2 and 3 that come to mind amid the easy-going seraphic smile of the second movement. This is treasurably satisfying music. Van Gilse was a man of principle and it cost him dear. He rejected in no uncertain terms various overtures from Germany during the 1930s. He paid the price in neglect when the Nazi occupation of the Netherlands came in 1940. He was active in the resistance as also were other Dutch composers including Lex Van Delden and Rudolf Escher. Van Gilse's two sons were killed by the Nazis and the composer himself died while in hiding in September 1944 and had to be buried under an assumed name.